Adidas Climachill Cosmic Boost - Buy or Not in Apr 2019? Adidas has worked on their Climachill technology in order to achieve maximum breathability so runners’ feet stay cool especially in hotter temperatures. The shoe’s flexibility is thanks to the PrimeKnit materials gives the shoe a sock-like fit; however, the PrimeKnit not only allows your foot to move naturally but also delivers an appealing color style. The shoe is manufactured with a medium width and features a semi-curved shape which adjusts to the natural shape of the foot for a comfy fit. The flexible features provide a responsive ride, but if you are runner looking to take on a variety of weather conditions be advised that these shoes do not fight off water in the slightest. That being said, if you are looking for a stylish and comfortable shoe that can deliver in warm or dry climates, this is a decent pick. Socks/feet may get wet as the upper is not waterproof. Some users noted minor irritation in certain areas of their foot. The Adidas Climachill Cosmic Boost outsole features a very thick rubber component. Adidas Stretch Web Rubber material promotes protection while maintaining durable qualities in high wear and tear areas. The outsole is also part of the reason why these shoes are guaranteed to keep your feet cooler. It protects the sole from surface friction while also protecting the foot from road debris. Additionally, the Adidas Climachill Cosmic Boost’s elastic outsole is flexible and allows the runner's foot to adjust to different surfaces while delivering solid traction. Some reviewers noted that the outsole wore down quicker than expected. The midsole of the Adidas Climachill Cosmic Boost shoes features Boost™ technology which is located on the front of the shoes. It is derived from TPU cushioning capsules that deliver both a comfortable and very responsive ride for almost all users. The technology works by transferring the energy of each foot strike for an explosive take-off. Another addition in the midsole is its EVA foam platform. This platform is located on the rear and midfoot area of the shoe and gives runners a smooth, responsive ride. The upper on the Adidas Climachill Cosmic Boost features the PrimeKnit technology which delivers a very good amount of flexibility as well as breathability. It resembles a woven cloth and is placed on the front of the foot to the midsection. The upper wraps around the foot snugly while keeping the foot cool and dry. Although this material is extremely comfortable, it is not waterproof by any means. On the rear section of the shoe, Adidas has implemented AIRmesh technology which keeps the foot stable. The Adidas Climachill Cosmic Boost weighs in at 7.7 ounces for men and 6.6 ounces for women. This shoe is definitely lighter compared to other shoes on the market. Although they are lightweight in nature, the Boost foam in the rear of the shoe gives explosive push-offs for quicker and more energized runs. Breathability in the Adidas Climachill Cosmic Boost is one of the forefronts of the shoe’s engineering. The Climachill technology is not very moisture wicking, but your feet will stay cool and dry, even in warmer weather. The PrimeKnit material on the upper provides 360 degrees of ventilation for a natural and breathable feel. AIRmesh on the rear section also promotes air flow so that the entire shoe is really working together to achieve maximum breathability. Comfortability is also one of the Adidas Climachill Cosmic Boost’s best features. Many compare it to walking on clouds, or like wearing socks around all day. The EVA is a super soft foam that is placed in the midfoot to heel section. The shoe’s performance of comfort is really seen in sprinting aspects. If you're looking for a long distance shoe, it may be best to look elsewhere. Otherwise, for sprinting, gym training and walking this shoe goes above and beyond the standard comfort parameters. The Adidas Climachill Cosmic Boost truly delivers style and performance into one cohesive unit. The Primeknit technology on the upper provides a two-toned spotted look that is visually appealing. The classic three-stripe logo sits on both sides of the shoe to offset the main color of the shoe. Adidas offers plenty of color options, from bold to natural. The midsole is mixed with white and the primary color to really bring the shoe together visually. The durable features of the Adidas Climachill Cosmic Boost are decent. These shoes are really made for short, explosive workouts on tracks, grass or treadmill surfaces. If those are the types of workouts you participate in, then consider this shoe. The outsole has been known to wear down a tad quicker than reviewers liked. The PrimeKnit mesh on the upper is very durable as long as it is not exposed to wet conditions. The reliable outsole unit on the Adidas Climachill Cosmic Boost is made with a rubber Stretch Web technology that endures constant use on hard, smooth terrain. This technology also has elastic features that naturally adapt to each athlete’s performance while providing a good amount of traction. The PrimeKnit upper is a strong, flexible material that specializes in breathability but also fits around the foot snugly for a comfortable, yet protective fit. The shoe’s cushioning also protects joints by providing shock absorption. Adidas Boost technology is the main reasons why the shoe is both responsive and comfortable. This shoe really shines on flat, dry surfaces. The PrimeKnit upper allow for flexibility and natural foot movement. The midsole of this shoe uses two separate cushioning systems to deliver an easy ride with a solid amount of responsiveness. TPU pellets at the front end of the foot transfer energy to the runner while the EVA foam at the midfoot absorbs shock impact during workouts. The Adidas Climachill Cosmic Boost has a unified support system that works throughout the entire shoe. The soft, woven-like material on the top of the shoe wraps around the foot in a snug fashion to provide security and support for an extremely cool interior feel. The secondary aspect to the shoe’s support lies within the midsole. Adidas Boost technology serves as an extremely cushioned system that provides comfortable and supportive features to the soles of your feet. The supportive arch structure is designed so that the forefoot and rearfoot move independently to adapt to every type of running surface. The Adidas Climachill thrives on flat and dry surfaces. They in hot, dry weather too because of the extremely breathable qualities. These shoes will satisfy workout routines performed on road conditions such as asphalt, grass and track surfaces. The added heel material will keep road debris out of the shoe and the underfoot has a reliable traction on smooth surfaces. These kicks are a little above average when it comes to price. You can expect to pay around $100 for the Adidas Climachill Cosmic Boost. Considering the technology in this shoe, it's definitely worth the price. The Adidas Climachill Cosmic Boost provides a good amount of traction. It will provide decent traction on longer runs, but Adidas designed this shoe specifically for short and explosive workouts, such as sprinting on flat and dry surfaces. The Adidas Climachill Cosmic Boost is very flexible mostly because of the upper. 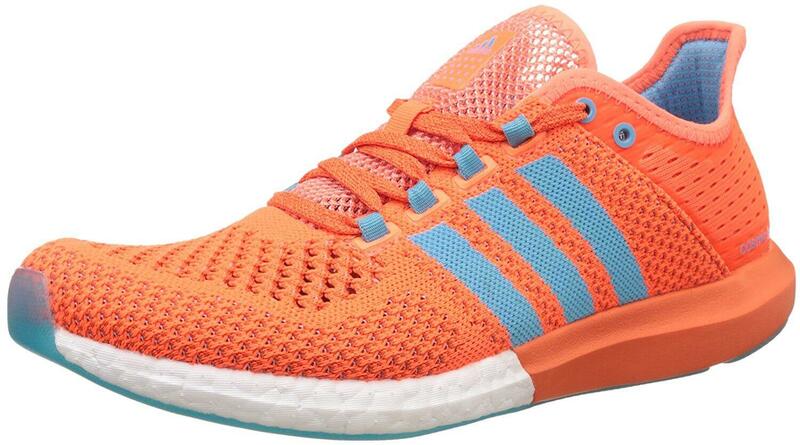 The PrimeKnit upper is stretchy and flexible and conforms to your foot nicely. Many runners have raved about how this shoe allows for natural movement. The interior sleeve also provides flexibility and the secure, sock-like fit of the shoe. 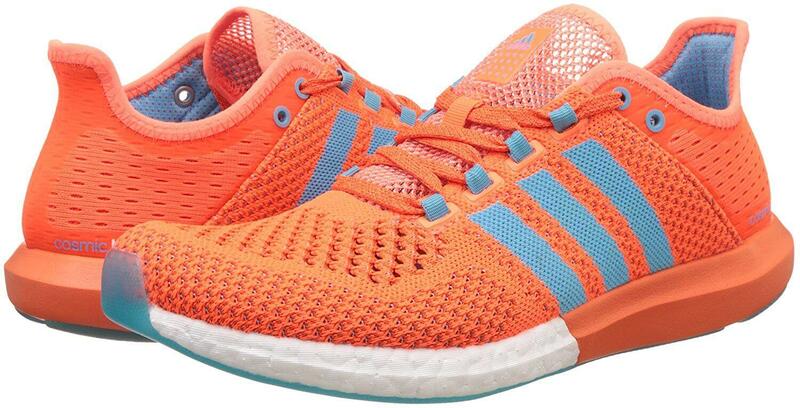 The Adidas Climachill Cosmic Boost is relatively stable. Adidas Boost technology gives runners a substantial amount of cushioning and comfortable support. These shoes deliver stability for fast, explosive workouts and less stability for long runs. The PrimeKnit technology may seem unsupportive but the material provides good support thanks to the tightly woven design. The heel to toe drop is 8 millimeters for both men and women. This drop is slightly less than average. • Airmesh technology which keeps the foot stable. The Adidas Climachill Cosmic Boost is a performance shoe that provides a solid amount of style that most runners can appreciate. This shoe has top-of-the-line breathability features. Cushioning and padding around the bottom and midsection of the shoe provide protection, stability, and maximum comfortability. When used on flat and dry surfaces during explosive workouts, the Adidas Climachill Cosmic Boost running shoes will thrive.